Recognised as a cover star by both Mixmag and DJ Mag (he also won the latter’s Best British DJ Award 2013), he recently sold out London’s Electric Brixton in a matter of days. His eagerly awaited Nightlife 6 compilation ran riot across iTunes dance compilation chart and hit No.1 on Beatport…. Armanni performs with many of the top Drum and Bass as well as Dubstep artists at almost all the top shows. Residencies have included Bassrush (LA), Platinum (Philly), DJ Series (Philly), Metalheadz, Heavy Duty and Ultraworld at Sonar (Baltimore). He has amazed crowds at the World of Drum and Bass, Electric Daisy Carnival, Nocturnal, Together as One, Starscape, Buzz, Ultra and many other massives sprawling from New York to Japan and from London to Australia. Armanni has toured with the likes of Goldie, DJ Craze, Kenny Ken, DJ SS, Dieselboy, Andy C and is frequently requested to MC exclusively for many other top djs in the industry. 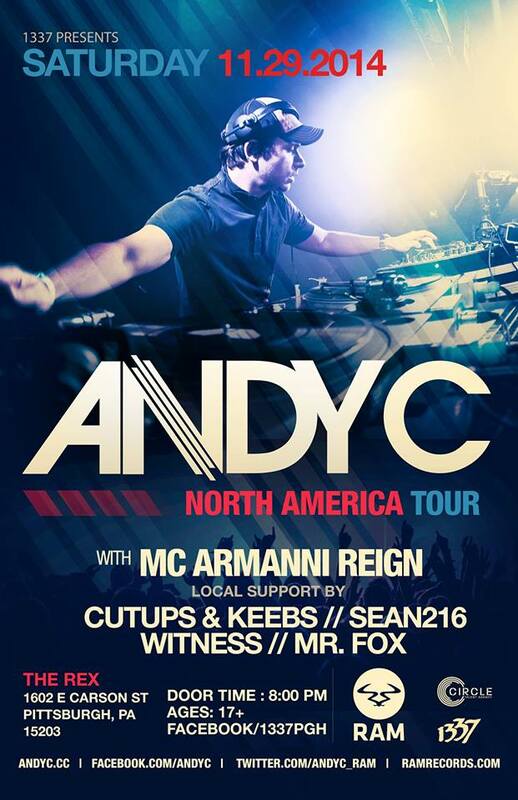 ♦ Only ten dollars for those who attended the Andy C show on June 24th. We have an email list that you all signed still. Will answer further questions about this in the future. Thank you for all your support. Last time Andy C’s flight got canceled last minute. We are very happy to have the chance to make things right and try his again. This is a Saturday show now instead of a Tuesday.